The rest of that verse from 1 Peter 3:15 is important to include: "But do this with gentleness and respect." Too often well-meaning Christians, convinced of the truth of our Christian faith, "lord it over" others, as if the truth were a billy club to knock some sense into people. Jesus, while reserving the right to tell it like it is to the heard-hearted religious leaders, more often adopted a more gentle, subtle approach with the common sinner (including His own disciples). More often Jesus, Himself, was asking questions - questions designed to make people think. The invitation is always there to come to our great God, like the psalmist exemplifies, with raw, brutally honest questions and even doubts. Quoting Psalm 22, our Lord, Himself, cries out, "My God, my God, why have you forsaken me?" It doesn't get much more honest and raw than that. Yet, Jesus, without ever sinning, brings that question to His and our heavenly Father. JOIN US! Grab your coffee, get your brain stimulated as we get the conversation started on "higher things" you probably don't talk about midweek with your friends. 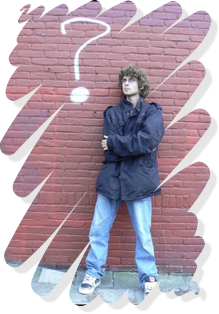 What question(s) do you have concerning the Christian faith but maybe were afraid to ask? Ask it here, or seek answers to your friends' honest questions by entering it below.